Poverty is the first thing the Facing Project faced. And for me personally, it was the first local issue I had ever faced. I had traveled around the world collecting stories about global poverty. I had an idea what it was like to be a Bangladeshi garment worker trying to make ends meet, or a slum dweller in Nairobi, but I had no idea what it meant to be living in poverty in my hometown of Muncie, Indiana. I heard a story on our NPR affiliate, Indiana Public Radio, about TEAMWork for Quality Living’s Circles program, which created intentional friendships between those living in poverty and those who weren’t. I volunteered for the program, and began to see my community in a whole new light. It’s easier to see, feel, and think about global poverty than poverty in your own community. It’s easier to see, feel and think about a foreign face living in a shantytown than a familiar one next to you in the checkout line or at the tee ball game or on the street corner. It’s easier to see the problems of a society that we don’t belong to. The closer to home the problems, the more invisible they often are. I know people who live in poverty in Muncie. I know their stories, and sometimes their thoughts and feelings they choose to share with me. I know their struggle. I have friends that live in poverty. But I’m still often shocked about the social, emotional, and structural challenges that my friends face. The first Facing Project was Facing Poverty in Muncie, Indiana. The project led to a deeper discussion and awareness of what it meant to live in poverty in our hometown, and inspired the creation of The Facing Project as more than just a one-off project. We’ll always owe Circles. 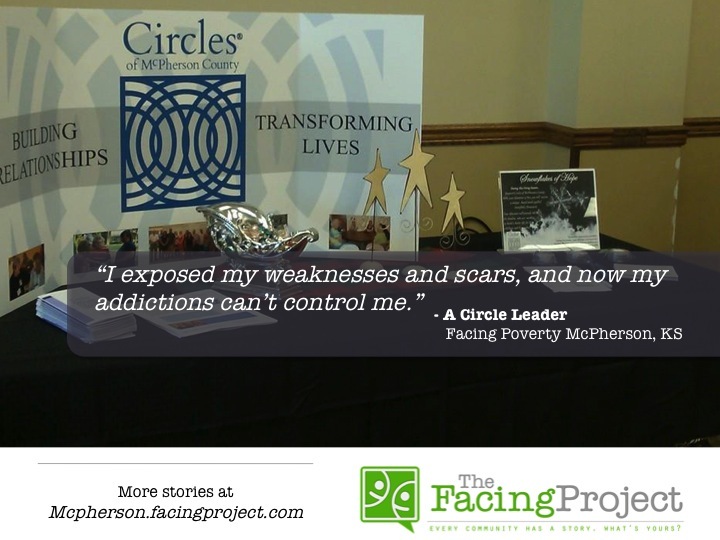 That’s why we’re thrilled that the Circles program in McPherson, Kansas, has just completed their own Facing Poverty project. The stories are filled with bad luck, abuse, homelessness, addiction, teen pregnancy, violence, guns, prostitution, and death. Stories that many of these folks’ neighbors could never imagine. 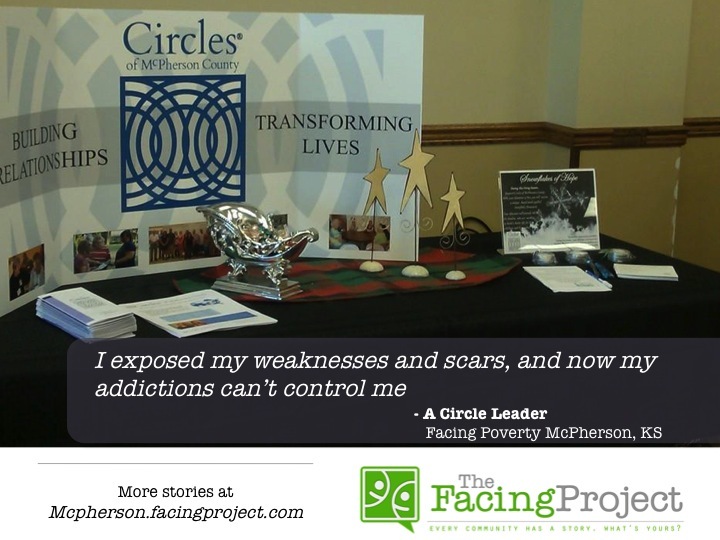 This week’s featured story is Building Character A Circle Leader’s Story as told to Anne Kirchner from McPherson’s project. You can read the full story here. The excerpt below reminds us of the importance of not allowing stories to own us, but owning our stories. Why the heck did God let all these horrible things happen to me? I’ve always been told God watches over his children with care and tenderness. If that’s true, then tell me why. Why was I molested by my cousin at age four? Why was I raped and beaten at age five? Why the heck was I molested again at age six and yet again at age fourteen? If God was truly the loving, caring omnipotent one, why would he allow his child to be violated over and over again in such a horrific way? No parent would ever allow something evil to happen to their child. Your parent should be there for you. If God “The Father” really cared about me, my story would never exist . . . I joined the Circles group thinking these people didn’t know what the heck I was going through. They had no idea what it’s like to be molested and raped over and over again. They didn’t know the pain of losing a child when one is just a child herself. They didn’t know what it’s like to puke your guts out because you consumed too many drinks. They had no idea what it was like to have no money to pay the monthly rent. They had never spun into depression when their children refused to acknowledge their existence. They didn’t know what it was like to come down off the ultimate high. They didn’t know the constant battle of waking up when you didn’t want to face another day. All the trauma I’ve experienced is more than one person should ever have to handle. Somehow I was able to share my story. And through the Circles process I learned I must be honest about my past. Henry David Thoreau once wrote, “Be true to your work, your word and your friends.” I live by that. I exposed my weaknesses and scars, and now my addictions can’t control me anymore.